As part of the process of your injury claim, it's common for the defense to request that you be examined by an “independent” doctor that they've hired. This doctor will conduct an examination of your injuries and prepare a report that must be made available to both sides of the case. In many cases that go to court, the doctor will also testify about his or her findings. We refer to these examinations and doctors as “independent” because oftentimes they're anything but. These doctors are hired by the defense in your case, and have usually been employed multiple times in the past by the same firms and same insurance companies for the same purpose. In some instances these doctors have established reputations for diminishing or underreporting injuries sustained by a plaintiff, and rarely even going as far as accusing the plaintiff of exaggerating or faking injuries. Your attorney can help you with this. You have the right to know the name of the doctor examining you; as mentioned earlier, some doctors have reputations for providing biased testimony for the defense firms and insurance companies that employ them. If that's the case with your examination, it's worth knowing up front. The dates of your injury, hospitalizations, surgeries, follow-up appointments, physical therapy, etc. Use this information as a reference when answering questions from the doctor, or when completing paperwork. In some cases, it may be advisable to actually share a copy of this document with the doctor, but you should seek the advice of your attorney before doing so. Defense examinations such as this often take the entire day, so plan on clearing your schedule on the day of the exam. You'll likely need to wait for the doctor to finish seeing their regularly scheduled patients, as well as emergency patients, before they're able to see you. If a psychological exam has also been requested, the process will take even longer. Be polite and courteous with the doctor, but keep your discussions relevant to the exam at hand. Never, under any circumstance, should you lie to the doctor conducting your exam. Use real-life examples and timelines when describing your pain, such as “I can't walk for more than 5 minutes without pain.” or “I'm unable to carry groceries from the car to my home”. This is not the time to take a tough-guy approach to your pain. If you claim that your injury isn't painful, the doctor will question whether you're injured at all. Exaggerating your symptoms. If you're caught embellishing the severity of one aspect of your injury, it draws into doubt your entire injury. Being inconsistent. This includes mentioning symptoms or side-effects that you've never mentioned before, but it also includes neglecting to mention things you have mentioned before. Denying injuries that have been previously documented. The examining doctor has likely read your entire medical file, and will be aware of past injuries or conditions you've suffered. Remember, don't lie. Talking too much. In addition to performing the exam, the doctor is listening for any details you mention that may undermine your claim and harm your case. Answer questions that you're asked correctly and politely, but being too talkative has harmed more than one case. If you're considering filing a claim for compensation for your injuries after an accident, an “independent” medical exam will most likely be part of the case, and the results of that exam will affect the outcome of your claim. An experienced attorney can help guide you through the exam preparation process, as well as through the claim itself. 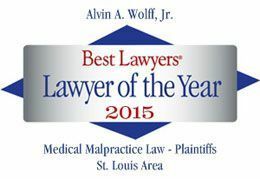 Call Alvin Wolff today at 314-241-2500 for a free, no-obligation analysis of your claim.